Fennel is one of those foods that, until recently, I only looked at in the grocery store's veggie section. If it ever made it out of the store with me, I had no idea what to do with it. That is until I started juicing. 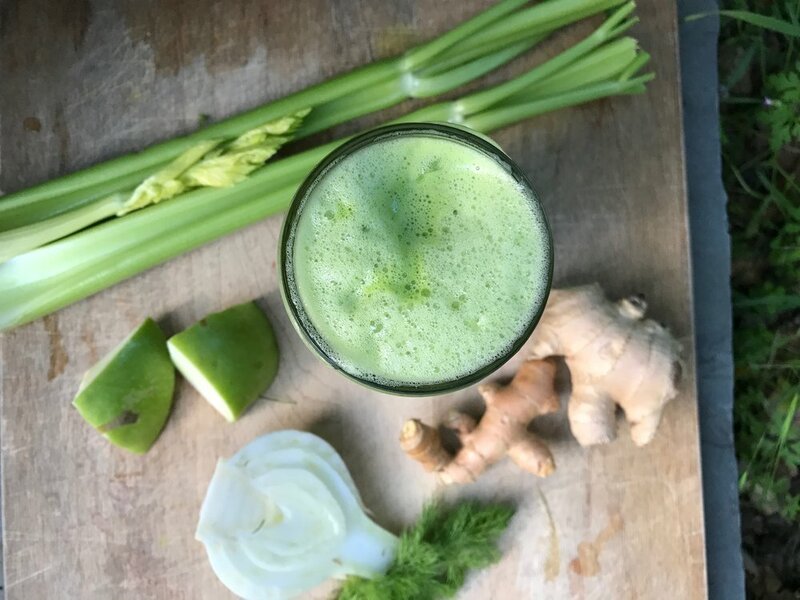 If you're like me, when you embarked on juicing, you quickly realized that the higher the water content in a vegetable, the more bang for your buck you'll get. Leafy greens like kale and spinach were quickly 86'd from my juicing parties, while celery, cucumber, and broccoli became regulars. And then, while cutting up the fennel for juicing, I'd find myself snacking on it. And then I realized it was so tasty! I would dip it in hummus, or just eat it plain, or add it to salads. I became a big fan. It has subtle licorice notes, an extremely cleansing, refreshing taste and a satisfying crunch. I soon wondered exactly what health benefits fennel contained, and I was not disappointed. For the next three days, we'll be focusing on BALANCING beauty foods and fennel is no exception. If you're looking for a food that covers a lot of bases - this one is it. It's hydrating, soothing to our stomach (which supports optimal digestion), and balancing to our bodies both inside and out. The main reason fennel is great for skin is its high vitamin C content. Since vitamin C is needed in the formation of collagen, its abundance reduces the appearance of fine lines and helps naturally slow aging. The secondary reason fennel helps us in the beauty department, is that it is wonderful for our digestive tract. Any time we aid digestion, we free up that energy and potentially inflammatory response to focus on higher-level stuff, like getting smoother, more supple skin and hair. Fennel contains an intestinal antispasmodic, which can relieve spasms and cramps. It also contains a compound, called carminative, that relieves gas. Yesterday we talked about how a food's appearance can tip us off to it's benefits in our bodies. Fennel is a great example - it kind of looks like a bone, and sure enough, it actually has bone-supporting properties. The calcium, magnesium, phosphorus, and vitamin K found in fennel are major bone-strengtheners. Fennel contains phytoestrogen, which, when eaten in moderation, can be a wonderful hormone balancer; helping with everything from male-pattern hair growth in women, to increasing milk production in lactating mothers, to boosting libido, to reducing menopause symptoms. (1) Because it is a phytoestrogen, (and same goes for any other "superfood"), you don't want to be noshing on it all day, every day. Moderation! Make sure you keep an abundant rotation of these foods and you will not have to worry about over-doing it on any of them. Fiber is another major player in fennel. Of course, if you juice it you'll be removing the fiber. But juicing is an amazing, easy-to-digest way to pack a ton of nutrients, vitamins, and minerals into a small package. Fresh-pressed, veggie-centric juices make a wonderful addition to your daily or weekly diet. *Please note: you'll need a juicer for this one! Simply chop the ingredients to fit into your juicier, juice, and drink up! The sooner you enjoy, the more active the vitamins and nutrients will be. Enjoy right away or refrigerate in air-tight container and drink within 24 hours. If you want to amp up your green juice, add a little natural sea salt, a pinch of spirulina, and/or a spritz of fresh lemon or lime. For the next three days, I've chosen foods that align with Beautycounter's No. 3 - Balancing Collection. By the way, I have the charcoal facial mask from this collection and I am obsessed. I also have the charcoal cleansing bar and there is no going back to regular cleansers! For more on why I chose to do this Inside Out Beauty Foods series featuring Beautycounter, see my intro blog post, here. I hope you are enjoying these foods and getting inspired to incorporate more goodness into your daily life. I sure am having fun writing and learning so much along the way. I'm also feeling amazing with this surplus of healthy foods to consume. Thank you for reading! 1. The Encyclopedia of Healing Foods, 2005. Michael Murray, N.D.